During the 19th century, what now comprises Sea Girt was originally farmland owned by Dr. Charles Montrose Graham and Mr. John Sherman. In 1853, Commodore Robert F. Stockton acquired the large tract of land and built a lavish summer estate in the area between Stockton Lake and Wreck Pond. Yet it was not until 1875, after a group of Philadelphia land developers purchased the land that Sea Girt’s growth as a community was spurred. Although during the early years Sea Girt was mainly inhabited by vacationers in the summer months, it quickly developed into a year round residential community. In 1887, by an Act of the New Jersey State Legislature, 120 acres were purchased for the New Jersey National Guard to use as a permanent summer training camp, rifle range, seacoast battery and mobilization camp for New Jersey Guardsmen. Still in use today by the New Jersey National Guard, the training camp, was initially used for the Guardmen who served in the Spanish American War, Mexican Border Campaign of 1916, World War I and World War II. In addition to its military function, the camp at Sea Girt was established as the Summer Capital of New Jersey and played a vital role in New Jersey’s political history.As the summer home to the Governor of the State, it was here that Woodrow Wilson learned of his nomination for the office of President of the United States and huge rallies held for Presidential candidates Al Smith and Franklin D. Roosevelt. By the end of the 19th century, the United States government obtained a plot of land along the Sea Girt shoreline to build a lighthouse. The Sea Girt Lighthouse, an L-shaped brick house with a central tower was erected and marked the inlet leading to the Wreck Pond. It also hosted the first radio beacon mounted in a shore installation in the United States. This lighthouse was the last shore lighthouse with an integral keeper’s residence built on the east coast of the United States. 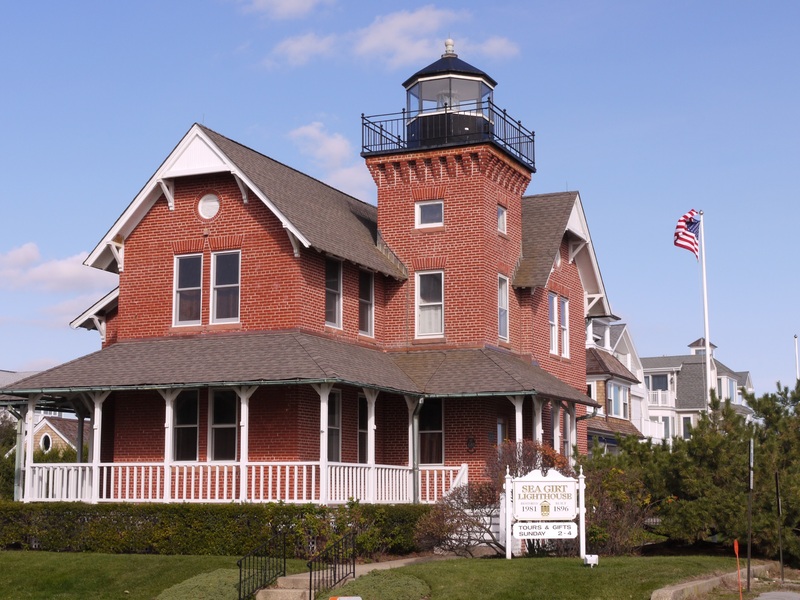 In 1955 the light was decommissioned and subsequently purchased and maintained by the Borough of Sea Girt until 1981. In that year, the non-profit organization, Lighthouse Citizens Committee, leased the lighthouse for the purpose of restoration, maintenance, and use for various community activities. The Borough of Sea Girt was formed as a municipality by an Act of the New Jersey Legislature in March 1917. Until then, Sea Girt was a part of the surrounding Township of Wall. Today, the Borough of Sea Girt still consists of the one-square mile locality between Stockton Lake and Wreck Pond with a unique history and the charm of a quiet seaside community.